Consciousness is what we, subjectively, are. Given that we are all different, it should not be surprising that everybody who bothers to develop some idea of what consciousness is, comes to a slightly different conclusion. And yet, while everyone has his or her own concept of consciousness, it appears that all these different concepts can be grouped into three complex families of related ideas or "knowledge systems" which form the foundation of three radically different world views. How the different concepts of consciousness in these three knowledge systems hang together and how they determine how we look at life and its meaning has been discussed in "Concepts of consciousness", one of the chapters of Infinity in a Drop. In this article we will explore a different idea, and that is to what extent it is possible to create a three-dimensional "concept-space" in which each individual concept of consciousness can find its own unique place. To define this concept-space I will use three simple ideas about the nature of consciousness: Matter, Consciousness, and Power. As may be clear, they form the core of the three much more complex conceptualisations of consciousness discussed in the other chapter. The idea to create this three-dimensional concept-space arose from the peculiar situation that all humanly distinguishable colours can be placed in a three-dimensional space, in which every colour is uniquely defined by three and only three numbers. What is interesting about these three numbers is, that they need not indicate the red, blue and green of the different cones that are present in most people's eyes. There are other three-dimensional concept spaces for colours. One which is popular amongst graphic designers consists, for example, of Brightness, Saturation and Hue. Brightness indicates here the place a colour occupies on a continuum between pure black and pure white. Saturation indicates a similar continuum between pure, colourless "grey scale", and full, radiant colour. Hue is a third number that indicates the place of the colour on a complex rainbow range between red and blue. The reason that the use of these three dimensions is popular amongst designers is that colours that are similar in two of the three dimensions but different in the third, tend to go harmoniously together. Somewhat intriguingly, the numbers indicating Red, Blue and Green are independent in the sense that every combination occurs and every combination indicates a different colour. In contrast to this, the numbers for Brightness, Hue and Saturation are not independent: if Saturation is zero, Hue becomes irrelevant, and to the extent that Brightness approaches either pure black or pure white, the other two numbers both lose their meaning. 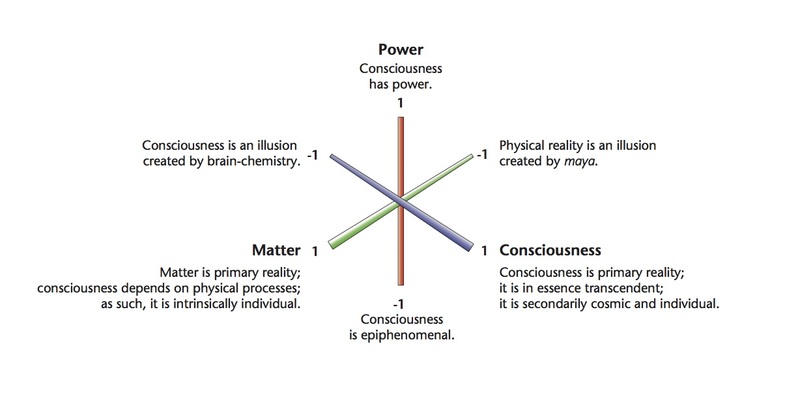 The three dimensions I suggest for concepts of consciousness, Matter, Consciousness, and Power seem to be fairly independent, though not all combinations lead to meaningful concepts of consciousness. In this article, I'll indicate, as exemplars, how a handful of well-known concepts of consciousness can be placed within this three-dimensional conceptual space at fairly well-defined locations, but to what extent this is true for all existing concepts of consciousness would need further exploration. As indicated before, a more subtle and nuanced discussion of what might well be the three most influential concepts of consciousness has been given in the chapter of Infinity in a Drop, called "Concepts of Consciousness". The present text is only meant as a play with ideas for those who enjoy seeing highly abstract concepts presented visually. For simplicity's sake, we limit in this discussion all numbers to the range from -1 (not there at all) to +1 (fully there), with 0 indicating agnosticism (nothing to say about it). All numbers are ordinal: they only indicate a rank-order, a rather vague and ill-defined "more or less", but definitely not exact quantities. The "Matter" dimension indicates to what extent a concept of consciousness is based on the idea that matter is fundamental and real. Matter = -1means that the physical reality has no existence of its own; it exists only as an illusion imposed by māyā on the infinite perfection of brahman. The "Consciousness" dimension indicates to what extent a concept of consciousness is based on the idea that consciousness is fundamental and real. Consciousness = -1 means that consciousness has no existence of its own; it exists only as a subjective illusion created by the chemical reactions in the brain. "The "Power" dimension indicates to what extent a concept of consciousness accepts that consciousness is not only awareness but also power. Power = 0 means "Nothing to say about consciousness as power";"
Power = -1 means consciousness, as far as it exists, is pure awareness; it is “ephiphenomenal” (it can have no effect on the material reality). Within the scientific mainstream there is hardly anyone who denies the primary and independent reality of matter. If this full acceptance of Matter is combined with a denial of the primary, independent reality of consciousness, one gets the strong physicalist position which holds that the physical nervous system "produces" consciousness and as such is essential for its existence. In such a view consciousness is thus limited to individuals with a working brain. This view tends to go together with a one-dimensional concept of consciousness where our ordinary waking state is the summit. Within the Indian tradition there is hardly anyone who denies the primary and independent reality of consciousness [FN to Charvaka]. There are, however, many in the Indian tradition who deny the independent reality of matter: some in the limited sense of holding that matter is ultimately the product of consciousness and as such dependent on it; others in the strong, exclusive sense that matter is simply not real at all. Amongst those who score high on this dimension, there tends to be a hierarchical understanding of consciousness where a completely "pure" transcendent consciousness is considered the highest, and the ordinary body-bound consciousness amongst the lowest. There also tends to be an acceptance of the ontological reality of subtle, nonphysical planes of existence. The Power dimension is perhaps the most intriguing. In both East and West, there is a tendency to see consciousness only as awareness and deny power to it. This, however, robs life of its meaning because it leaves the world — in the language of science — as a causally closed mechanical machine, or — in the language of Indian spirituality — as a fate-driven product of karma and māyā without intrinsic value. If one accepts the possibility of consciousness independent of matter as well as the reality of consciousness as power, there arises the possibility of genuine agency and with that the possibility of an enduring value of the manifest world and our individual lives within it. Consciousness is the carrier of our sense of identity and in the Indian systems of thought it is the element in us that is potentially eternal (the puruṣa). Accepting that consciousness has power, implies then that even our eternal being can have qualities, intentions and "work to do". This in turn might open up the possibility of our svabhava and svadharma belonging to the soul, rather than to one of the subtle worlds, and with that of a unique, eternal, qualitied, and evolving soul. This has been discussed in more detail in the chapters of Infinity in a Drop dealing with "the Self and the structure of the personality. A three dimensional grid that is based on the kind of simplified concepts given above, will obviously not do justice to all the subtle differences between the various positions and there is no claim that the often finely nuanced positions of individual authors will all fit exactly under any one of these three labels. Its only purpose is to clarify the basic lay of the land. The only suggestion made is that different theories will score differently on these three dimensions and will find a distinct place somewhere in this three-dimensional space, a place that is defined by three numbers that indicate to what extent the concepts subscribe to these three ideas. The modern, common sense position of people without too much spiritual experience: Matter is primary (1); consciousness is also real, but it is dependent on a well-functioning physical brain. The content of consciousness is largely determined by our physical senses plus brain-based memories and processes (0.5). Subjectively, it feels as if we have a free will and agency, but that may be an illusion. If it is real, this might indicate the power of consciousness. Either way, this power is very limited and has only a small effect on the physical, social and even mental reality we live in (0.25). The hardline, exclusive physicalist position of Patricia Churchland[REF]: only matter exists (1); consciousness and its power are both illusions(-1). The “epiphenomenal”, physicalist position of Daniel Dennet and John R. Searl[REFs]:the physical reality is primary (1); consciousness exists, but only just: it exists only in a relative, subjective sense and is dependent on a well-functioning brain (0.1); it has no effect on the material world (-1). The exclusive māyāvādin position: only the conscious spirit exists (1); matter and its power are illusions (-1). Sāṁkhya: matter exists (as part of prakṛti, Nature), but is less important (.5) than consciousness (puruṣa) (1). There is no power aspect to consciousness (-1): the puruṣa is pure awareness; all energy and action belong to unconscious prakṛti. The aim in many Indian spiritual traditions (other than the integral). Only pure consciousness is real (1). In different conceptions of nirvāṇa and mokṣa, the Matter dimensions can vary from say (0.1) (“seemingly real as long as karma lasts”, or “out of compassion to be regarded as real as long as any sentient being remains unliberated”) to a pure (-1) (māyāvādin traditions that have as ideal “not to be reborn”). Accordingly marked as (0), meaning here: can be anything and is of no real interest. The power dimension is -1, unless there is a Tantric influence as in some schools of Tibetan Buddhism. The starting point for Tantra: conscious energy is the main reality and main instrument used for sadhana (1); the physical world is real, but ultimately subservient to power (.5). While consciousness is seen as primary in theory, in practice it is not as it follows physical methods (.75). The ultimate aim tends to be, as in most of the Indian tradition, (-1, 1, -1), as the ultimate aim is still formulated as mokṣa. The fully integral position: the physical and spiritual realities are equally important and real (1); consciousness is power (1). Even within the integral position there is a tendency to see consciousness as primary and matter as real but dependent on consciousness (.5, 1, 1). As mentioned at the beginning of this article, for a more subtle and nuanced discussion of what might well be the three most influential concepts of consciousness you could have a look at a chapter of Infinity in a Drop, called "Concepts of Consciousness". Comments and alternative suggestions are welcome!